Moroney is a graduate of General Seminary (M.Div. ’92) and received his Ph.D. in Liturgy from Milltown Institute of Theology and Philosophy, Dublin, Ireland, in 2008. 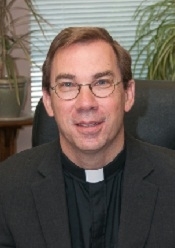 He is currently the Rector of Christ Church Ithan, in Villanova, Pennsylvania, and serves as an Adjunct Professor at the Lutheran Theological Seminary at Philadelphia. He taught Liturgics at The Church of Ireland Theological College in Dublin from 2000-2005 and is the author of many published papers on the topic. With the departure of Prof. Patrick Malloy to assume his new position at St. John’s Cathedral, Denver, General Seminary begins its search for a new full-time Professor of Liturgics. During this time, Moroney will teach the foundational liturgy class, as well as a liturgical practicum in the chapel. He is particularly enthusiastic about the potential for the practicum to empower students to lead worship in our broad Anglican tradition. Moroney will become a full member of the GTS community, participating in chapel and sharing meals in the refectory.